The story of a potentially revolutionary game that sparked fans' imagination, skepticism, and anger all at once. Sean Murray has spent his whole life feeling like he should be embarrassed that he's into video games. This is a weird thing to tell me while we sit in a hotel suite in Midtown Manhattan in late March, as he shows me the video game he helped create over the last five years. "When I'm feeling excited about games and I start talking about them to my friends who don't play games that much, I start to feel a little embarrassed when I hear the words coming out of my mouth," he says, laughing. But perhaps that's why Murray's game is quite unlike anything games have ever seen before. Murray, 36—a soft-spoken Irish man who spent part of his childhood on a lonely farm in Australia—is the co-founder of Hello Games, a small UK studio that was suddenly thrust into the very forefront of the video game industry, above all the Call of Dutys and Halos and Marios, in 2013. 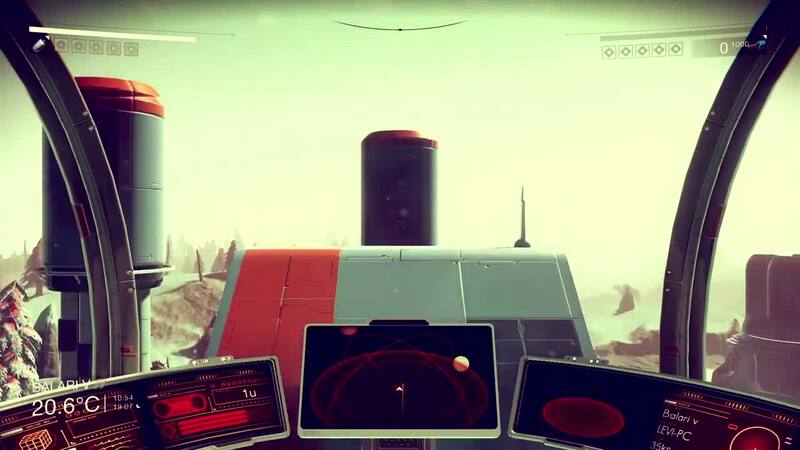 That's when Murray and Hello Games released the trailer for something that seemed impossible: No Man's Sky. 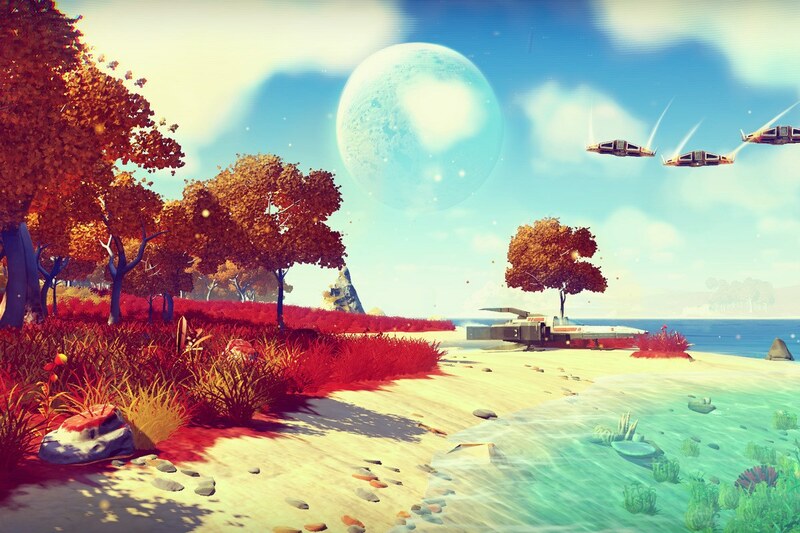 The trailer spoke for itself: No Man's Sky would portray an infinite universe, full of planet-sized planets and vast star systems, each one unique and built to scale. 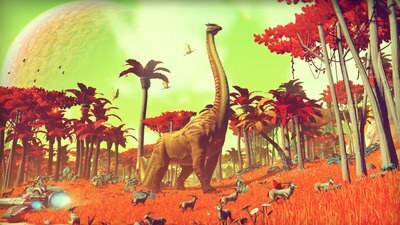 The entire universe would be procedurally generated, which is game development parlance for saying that No Man's Sky is ruled by math—layered algorithms and formulae spiraling outward, randomly creating unique planets and the flora and fauna that populate them. "That's what we do," says Murray. "We generate the world around you using maths. The input is where you stood, the math runs its formulae, and the output is everything you see. We don't store it on the disc, we don't pull it from the cloud—you fly somewhere, it generates around you, you fly away, it gets thrown away. You go back, it gets generated exactly the same way again." Murray is currently showing me a version of No Man's Sky specifically designed for this demonstration, one that features an array of planets in order of increasing complexity: We start on a barren, flat world, then move to one with caves and valleys. On another, there's water and alien greenery, except it's not all green. Some trees bloom red, some grass has a bluish hue. Finally, on another, there's life—benign quadrupeds calmly milling about. Fish-like lifeforms swimming in the water. 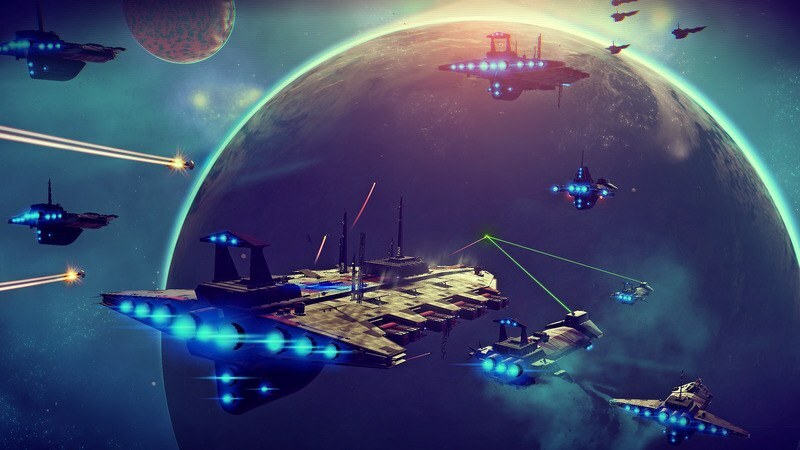 "The cool thing is that it doesn't repeat," says Murray, describing the math that rules No Man's Sky. "It's unpredictable. Little changes have massive impacts, so it's non-pattern-forming. You could fly around forever and you would never see the same pattern. You wouldn't see it repeat." 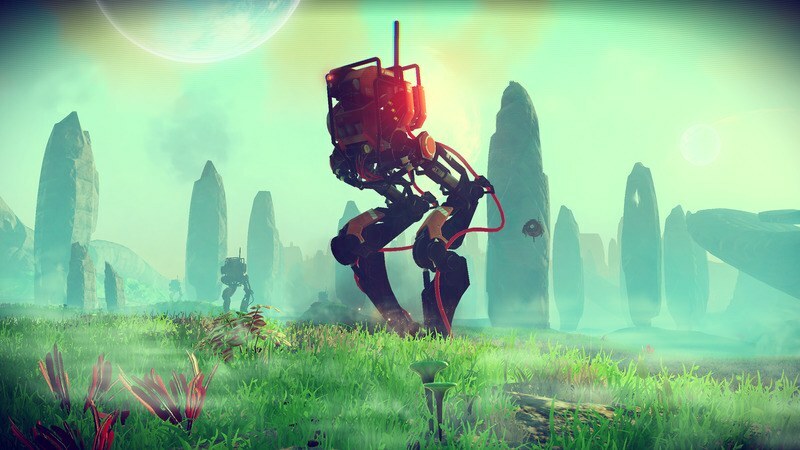 And that's why No Man's Sky has become such a locus of fervor and anticipation among the game-playing set: These are lofty promises, possibly the loftiest ever made in video games. An infinite universe for you to explore in your custom spaceship, each planet unique and full of things to do and see. A virtual space that's too big to possibly reach the end of in a lifetime, where you'll likely be the first—and possibly the only—person to ever see a particular planet or life-form, and therefore name it, like a sci-fi Magellan. All made by a tiny team of developers whose previous work was a simple little game about being a motorcycle stuntman. Now Murray is showing me a version of the game more representative of what the game will look like when it launches this week. We're on an icy planet where docile creatures roam about, with alien structures in the distance. "When you land on a planet like this, you can't look up a YouTube video for it," Murray says. "No one's been here before. You are genuinely lost and you can get completely lost. So you have to try and find your way around." Landing on a world, getting your bearings and making the most of your resources—that's what most of No Man's Sky is, all told. You'll have tools for this, gear like binoculars and scanners and a sci-fi multitool that looks like a gun but can also be used to mine resources—you'll need those to upgrade your tech and fuel your ship. But there's also intelligent alien life in No Man's Sky. There are alien races you can become friendly with for the purposes of trade—or shooty with, should you choose to be more ruthless. "So you can play as a jerk," I say. "I can play as a jerk, yes," Murray laughs. "A giant space-jerk, if you wish." Murray then takes me back to his ship, which he boards and pitches upward, piercing the atmosphere. There's something he wants to show me. 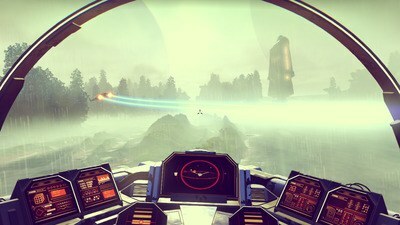 As resistance heats up the windshield, I ask him: Why the name No Man's Sky? "I wanted to think of something that wouldn't look out of place as the name for a band, or a book, or an album. We're this tiny little team, and we wanted to stand out, so [we chose] something a little more artistic. Games are traditionally called slightly embarrassing things, like"—Murray pauses to take on a Christian Bale-esque Batman growl—"Gears of War, or Bloodborne or BattleBlood. We just wanted to think of something that would feel like a science fiction book cover." "The cool thing is that it doesn't repeat," says Murray. "You could fly around forever and you would never see the same pattern." That No Man's Sky has inspired such vitriol is a little surprising—even to Murray. It is, in Murray's own words, "a chill game," one that he admits isn't going to be for everyone. It's a case study in expectations. Communities can form over the slightest hint of something exciting and foment into an audience eager for a thing they've created in their minds together—something that might not actually be what the creators promised. This is something we've seen a lot in the past few years, as fandoms quickly glom onto a strict, conservative ideal of their anticipated entertainments should be like, only to find creators intend to do otherwise—which then causes these fans to funnel their frustrations into often-nonsensical social media riots. At this point, Murray has landed his ship on a space station in orbit around the planet we were on. "The reason we're in here is kind of the stupidest thing, but I love it," he says. "There's a window," he says, walking down from the ship to a corridor, and then finally, our destination: an observation deck. "That's the planet that we were down at. And my crosshair, in the center of the screen? That's about four pixels by four pixels. That's about the size of the area we were playing in earlier. It just gives you a sense of the scale." Murray ends his presentation with a trick he's grown fond of over the three years he's been showing off No Man's Sky—It's one he pulled when he demonstrated the game for Stephen Colbert on The Late Show last fall. It's a great, beautiful trick, one that sells the game's vastness and ambition in just a few seconds. Sean Murray presses a button, and we zoom out from the space station to a map of the star system we're currently in. Then we zoom out further, to our galaxy, suspended in space. Then further, to a view of many galaxies and star systems spread across a universe with no real end but a defined center. Each of these galaxies and star systems are places you can travel to in No Man's Sky, full of planets and moons and asteroids and space stations like the one we just left. Even if millions of people buy and play this game, the odds of any of them crossing paths, according to Murray, are virtually impossible. The universe, he says, is just too big. "I don't know if this is cool, or really sad," Murray says as our time comes to an end, "but most of them will never be visited." 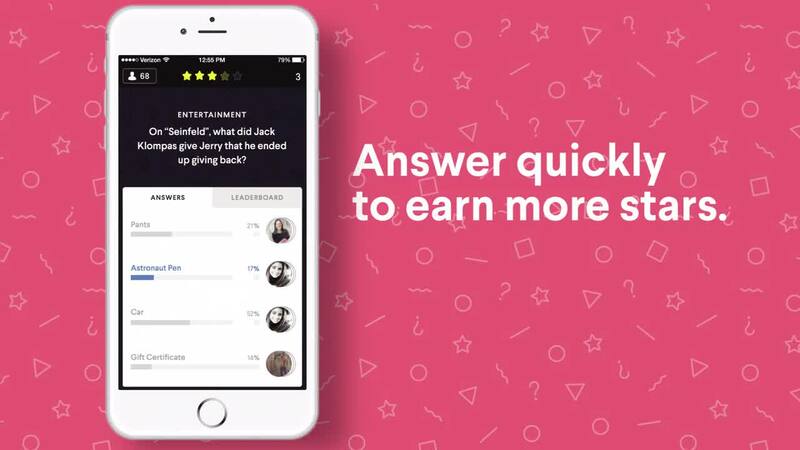 NEW: Download the newest trivia app for iPhone here and Android here!